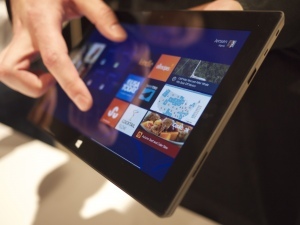 We just had our first hands-on with the Microsoft Surface, the brand spanking new device which appears to be Microsoft’s loud and clear answer to the Apple iPad, the MacBook Air, the menagerie of Android-powered tablets, the existing suite of Windows-powered tablets — basically, the entire landscape of today’s most powerful and popular mobile computing devices. It’s a very ambitious effort that the company is making great pains to emphasize has been built by Microsoft from the inside out, from the hardware to the software. Now it bears mention that quite a few details on the Surface are hard to pin down. 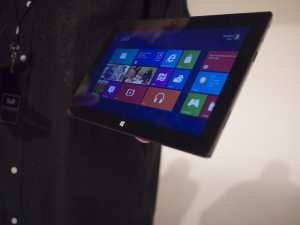 There will be two main versions of the device, the Microsoft Surface for Windows RT, and the Microsoft Surface for Windows 8 Pro. Microsoft has made it clear that it has contracted the manufacturing of the device as a whole, but it is not giving much color on the granular level: Who has built the processors that make up the Surface, the other components that make it up and so on. Pricing has not been revealed at all — Microsoft is only saying both the RT consumer version and the higher powered Pro versions will be at price points that are “competitive” to their peers. The RT should be out in time for the holidays (at the same time that Windows 8 should roll out) and the Pro version of the tablet will come out three months later. Below are images from our hands-on with the device. Click on each one to enlarge it. 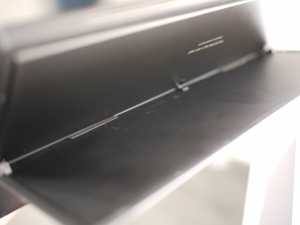 First we got a look at the kickstand that’s built in to the Surface, which is a clear differentiator from the iPad, for which users have to buy separate accessories. The kickstand was made to click in and out on the tablet with ease and style, and a satisfying “snap” sound — the company says it spent lots of time developing the three hinges that make it work, modeling them after the doors on a luxury car. 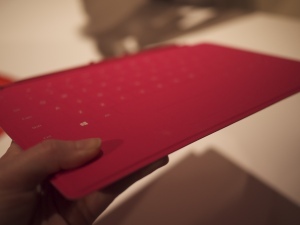 Next we looked at the included cover, which doubles as a touch keyboard. It has a soft rubbery feeling, but the keys don’t compress when you touch them. It also does not bend at all, unlike iPad covers — obviously, as it does more than just cover the screen. 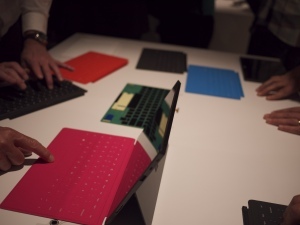 Microsoft says it made the hinges and cover to give it a bookish feeling. They come in several different colors. Then we looked at some of what’s made up the device — Vapor MG, the trademarked Magnesium alloy developed by Microsoft that makes up both the inside skeleton and the outside of the Surface. Microsoft is proud of this because it’s both strong, lightweight, and sleek — several times they pointed out to us that it’s far superior to plastic, which is pretty clear when you get a look and feel of it. Then at the end was the big reveal — the screen switched on (yes, there was only one part of the hands-on that gave me a feel of how the touch screen works.) It absolutely is a high-definition screen, but I wasn’t given the ability to zoom in and out of a photo to see how quickly you could really render an image. As for the feel of the device? 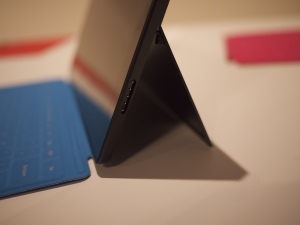 Its edges have a bit of a slope to them, but they are certainly more squared-off than the latest versions of the iPad. Personally I feel like it ends a more business-like feel to the Surface, where the iPad feels more fully for entertainment purposes. But again, a totally subjective take on that. In all it is a very nice, well-thought out, impressive effort from the folks up in Redmond (by the way, it’s still a mystery as to why this event was held in Los Angeles, but I suppose it was a nice excuse for us tech-focused folks to visit the headquarters of glitz and glam.) We still could be several months out from the Surface’s actual launch, but what we’ve seen so far looks pretty promising. Carrier IQ - Your Phone Knows You! Its all about CES 2012! Copyrights reserved. Simple theme. Powered by Blogger.